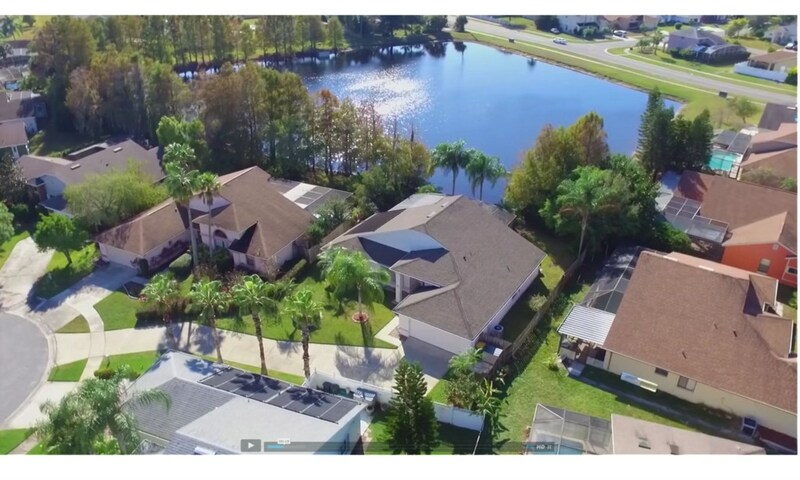 3 bedroom, 2 bathroom villa in the Cypress Lakes community. Owned by Chris Melaisi. Ref: 796. We are the Melaisi family, owners of Bearlake villa. Due to my husband’s commitments we currently live between Qatar and the UK. 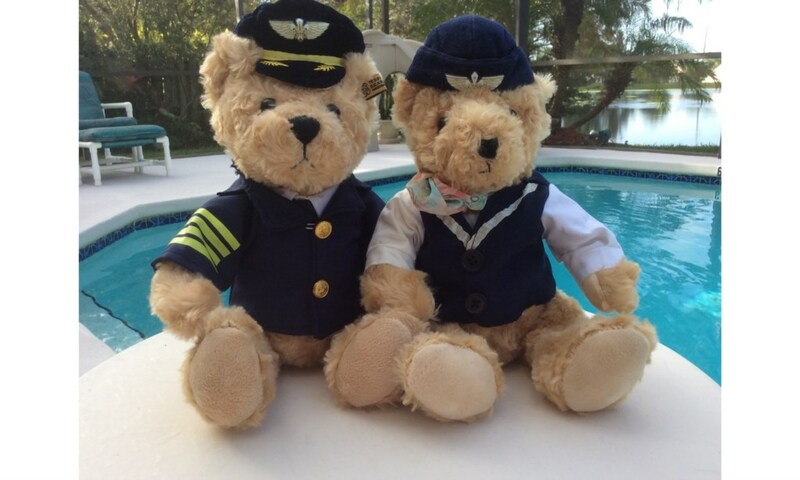 He is currently a long haul pilot and we have been fortunate to travel extensively. A few of our hobbies include Art, Music and the wonderful theme parks . For all of our family FLORIDA offers all this and much more. Through our family we were able to take over and run the villa and continue to keep it to its normal high standards. We believe it should feel like home from home. It is well equipped and truly private and tranquil. It has easy access to the theme parks and surrounded by good shopping facilities & restaurants. We are proud to say we have had repeat guests over many years and this is due to our commitment and effort in keeping the villa well maintained and updated just as one would expect in their own home. For privacy reasons, the marker on the map shows the Cypress Lakes community location and not actual villa location. The villa is situated on Cypress Lakes which is quiet mainly residential area ideally placed among small lakes and conservation areas. 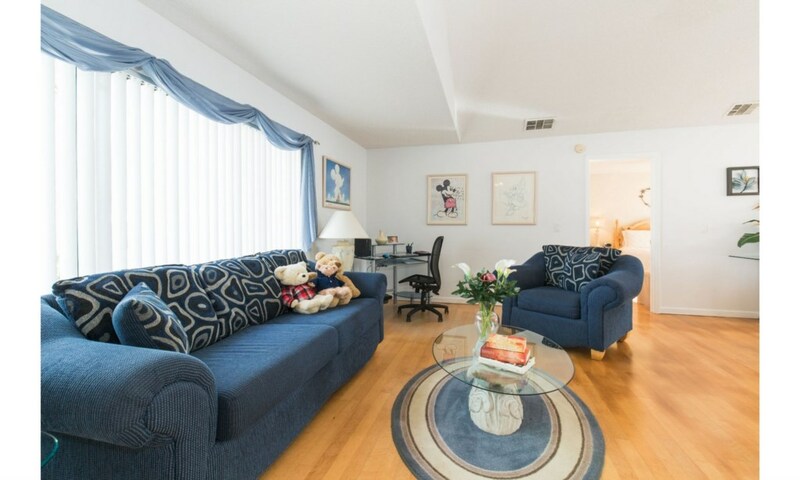 The area is just 15 minutes from Walt Disney World® Resort on the new direct link, Osceola Parkway, and just 3 minutes from the local shopping centre which includes two supermarkets, a large Wal-Mart and numerous other small shops and restaurants. It is also about 20 minutes drive from the main shopping malls and other attractions. The location includes, within 5 mins, a children's play area, tennis, basketball and two nearby golf courses. The villa is ideal for the times when you want to spend a quite time away from the parks. When you sit in the pool area you are not overlooked by any other homes and can truly relax. If the children don't want to play in the pool then there's always the games room to keep them happy. If you do need to keep in touch with friends then our wireless broadband PC can help. While we may have a biased view of all that our home offers please read what our visitors think before you read our full description. Naylor family: The villa was perfect, all we could want, ideal location, will stay again. Garrard family: Fabulous villa, best beds ever, we don’t want to go home. Morgan family: Fantastic villa could not get out of pool, children loved the slide. Turner family: After renting homes for the last five years yours has been the best, the location is also ideal. Your home offered everything we could want and more. The photos alone sold me but after experiencing the pool and that wonderful coffee machine we will be back. Higgs family: Amazing holiday but your beautiful villa was the icing on the cake. Garry family: Great time, spent lots of time in the pool watching wild life on the lake. Simone family: Villa clean and well stocked with everything we could need, will be back. 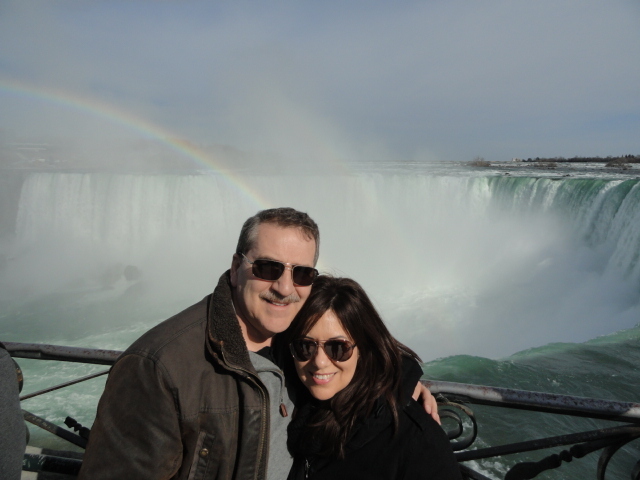 Lynne family: …cannot believe it has been five years since we were here and it’s even better. Macy family: Wonderful home….thanks for all advice before and after booking. Kyle family: Great villa, cannot praise all your help and advice enough, it made a real difference. Dewar family: This was our 11th visit and we will be back again in 6 months. Over 90% of our visitors leave us feed back and so far it has been 100% positive. A superbly decorated and furnished property fully equipped for up to 6 people. Well positioned on a oversized plot overlooking a lake and near a conservation area. The villa is located in a small circle of only four homes and this is set off from a 'no through road' giving a quite location with no passing traffic. This villa has a large sun deck which is facing South West allowing both sun and shade all day. You can sit and have your breakfast or morning coffee while enjoying that pleasant warmth of an early Florida morning. 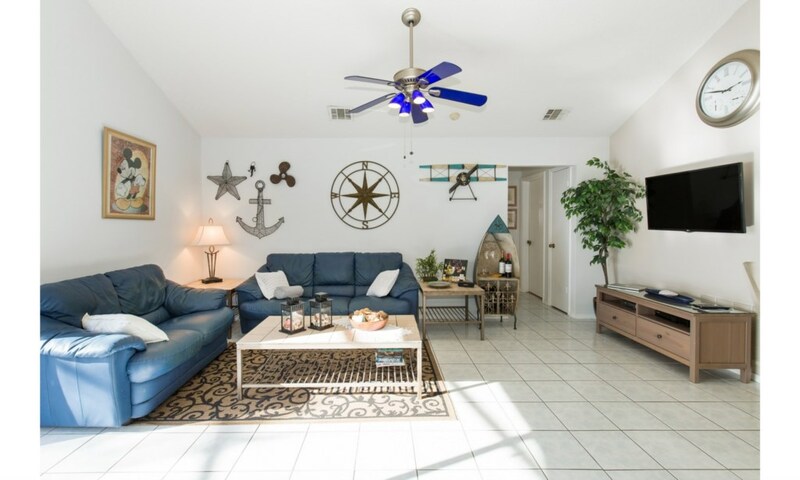 We have just updated most of the furniture and decorations in the living areas and included a new 42" LED TV in the family room; all of which can be seen on our new virtual tour. We wanted a clean but luxurious approach to our floors so we had a Maple hardwood floor laid in the living room, dining room and all the bedrooms. 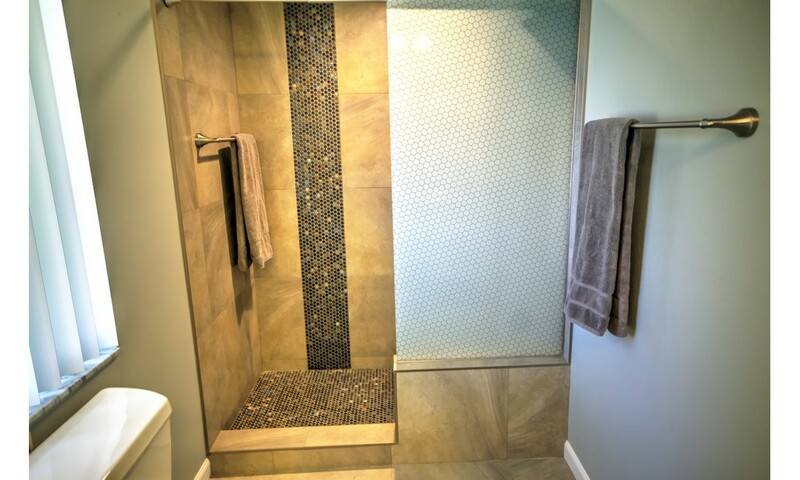 We complemented this with a ceramic tile for the kitchen, family room and bathrooms for a clean and functional surface. There are three bedrooms which include a master bedroom with queen bed and walk in closet, TV and DVD, vanity unit and en suite bathroom. Bedroom 2 has a queen bed with another TV and DVD, the 3rd has twin beds also with TV and DVD. Two cots, a high chair and a stroller are included for those with younger children. The villa has a large kitchen and family room with the new 42" TV and DVD. The Nook area provides an indoor casual eating area where you can relax while watching both the pool and lake area. The sofas in this area give you a place to all relax while watch one a the many channels available on the HD TV. The kitchen comes equipped with everything you should need to make your stay easy and enjoyable. We have also added some extras that are not so normal such as a rice cooker and Krups Juicer for those that want that special homemade fresh drink. However for those of you who that love their coffee an extra treat awaits you here. 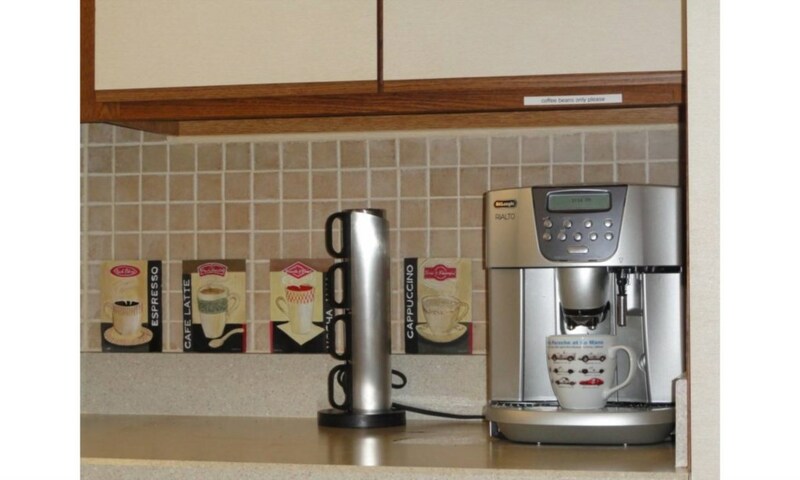 We have installed one of the latest one touch Bean to Cup coffee maker by DeLonghi. A single touch will grind the beans and then deliver a perfect one or two shot Espresso, Latte or Cappuccino. The machine can switch on automatically in the morning ready for you to have your morning drink while you sit by the pool and watch the wildlife on the lake. If you feel like a little time on your own then you can always move to the separate formal lounge. This has a soft sofa and chair, a music centre with docking port and the villa's WiFi station. This also comes with a printer for those that need to produce their own boarding passes. A six seater glass table provides the main feature of the formal dining area should you want to sit down for a family dinner. A family bathroom, a laundry room with washer and dryer and a games area, described below, complete the indoor areas of the villa. The pool measures 30' x 15' and has solar with electronic control and electric heating for the winter. The oversized pool deck (900sq ft) has two loungers, two reclining chairs, a table with chairs and two sun umbrellas. A good view over the lake makes this an ideal place to relax in between your days outings. The lake may also be fished freely and we provide a selection of rods for your use. If you or the children want to do something different then why not try our games room. Here you will find a pool table, air hockey and foosball. The property has well maintained gardens, with palm trees but oranges can be picked when in season from our own tree. Hibiscus and jasmine are some of the plants that add colour and complete privacy as they cover the side views of the villa so that it is never overlooked. The optional electric pool heating will boost water temperature from Oct to Mar. Full Air conditioning, Dishwasher, Washing Machine, Tumble Dryer, Cooker & Microwave, Fridge/Freezer, Waste Disposal, Telephone with an Answer-phone and free call package to most countries, Hi Speed WiFi with printer, Monitored Alarm System, 4 Cable TV's and 4 DVD players, Iron, 3 x Hairdryers, Safe and a family of 7 Teddy bears. Stays of less than 7 days should add $70 cleaning charge. Pool heating, if required, is an additional charge of $24 or £15 per day. Average rating: 5.0 / 5 from 30 reviews. This was our third time at Bear Lake - and can't wait for the fourth! Villa is perfectly placed for getting to Disney Parks - Universal - and Celebration. Shops and Gas Stations literally within 5 minutes - and more shops and restaurants less than 10 minutes in the opposite direction. We just love the situation of the villa - overlooking a beautiful lake - with lots of wildlife. The aspect of the villa means that we can sit looking at the lake and watch the sun go down - heaven. Next time we stay we might move in permanently! Fantastic villa well appointed home from home. The ambience was great with beautiful views over the lake. So much wild life to watch ...we even had 100 pelicans descend on it one day. The attention to detail in the furnishings was lovely and the pool was amazing. It was very easy to get to all the shops and attractions and not far from Orlando International. Very nice home for two weeks. Lovely house, very handy for the airport, parks and NASA. Quiet area with shops and restaurants close by. Great info and contact from the owner when booking and before we were due to fly out. Will use again when we go back in the future. Stayed here for the first 2 weeks in July and I can honestly say that the villa made the holiday. I was there with my now husband (we got married while we were there) our 2 teenage daughters and my in-laws. The villa was in a fab location and within easy driving distance of all the parks. It was in a very quiet neighbourhood with really friendly neighbours. The villa itself was very spacious and had everything you required to make your stay there a home from home experience. The pool was just great and so nice to sit out at night and watch the sun go down and look out for the wildlife. We even saw the local armadillo. I would highly recommend this villa. You have Walmart and other shops a 5 minute drive away and after a few days we got to grips with the location. If we ever go back to Florida this will be where hope to stay. The owners of the villa were great from booking the villa to all the useful information they emailed us. 5 star Vila. We had a wonderful holiday at the beautiful Bear Lake Villa. Great location for parks and shopping. Villa so comfortable and well equipped. Fabulous pool with water slide, couldn’t keep our son out of it. Stunning views, going to miss watching the beautiful sunrise each morning. Can’t wait to plan a return visit. We had such a great time staying at Bear lake villa. It made us feel at home but with all the little luxury’s that you wish for a holiday. We have two young children who didn’t want to leave as they absolutely loved the pool and had so much fun on the slide. We are all missing it already and can’t wait to go again. Fantastic villa, close to all parks, shops, malls. Thanks melasi family for letting us use your home. Amazing villa. A real home from home. Great location. This villa has everything you need and more. Pool and all facilities are first class and so comfortable. I stayed in bear lake for 3 weeks and could not recommend this villa enough. 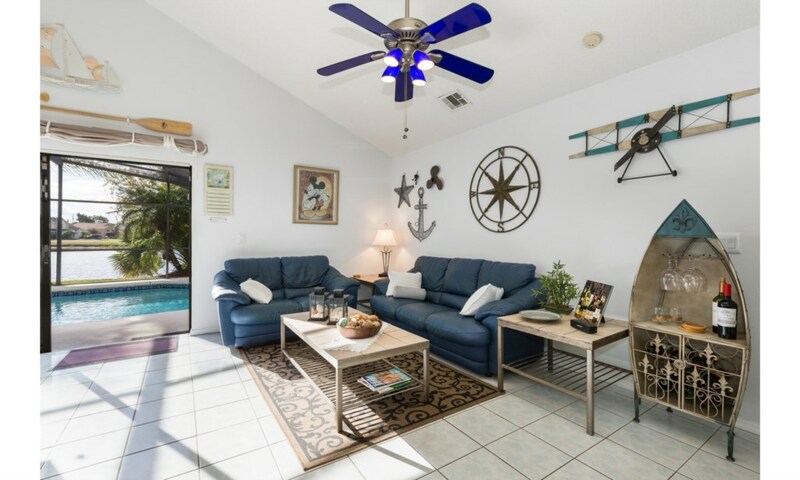 The villa itself was so clean and spacious and the owner sent me a full package and helpfull information before my departure.It is within a 20 minute radius to malls, Disney parks,etc and the pool was fantastic. I could not have wanted for anything else. My 3 children range in age from 6 to 16 so between the pool and Wi-Fi they were never bored. This villa really played a major part in making my holiday amazing ????? This was our first trip to Bear Lake Villa and it didn't disappoint. It was like home from home with all the lovely little touches. The pool was splendid, after a busy day at the parks, it was wonderful to come back and relax at this beautiful villa. We will be back - thank you. Villa lived up to our expectation - great location - lovely ambiance & a great pool & slide for our little grand-daughter. 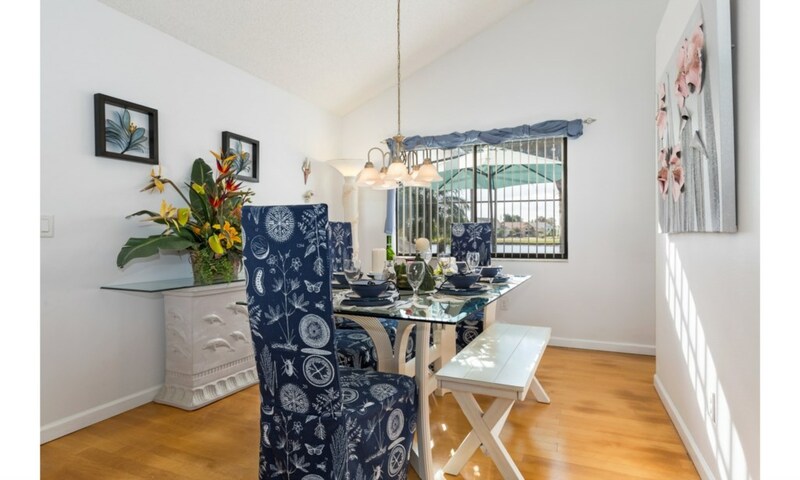 perfect location for The Disney resort & local restaurants - villa well laid out with all amenities and lovely furniture - highly recommended for any family visiting Orlando for Disney. We have stayed in Florida some six times. Each at self catering accommodation. Bear lake is a great location to see Kissimmee and Florida. The bungalow is lovely with a fantastic swimming pool. There is plenty of household equipment for all your needs. The local area is quiet and very pleasant. A great time was had by my family and I. The Villa was amazing, had everything we needed. The pool is fantastic with superb views over the lake. Close to all parks and amenities and very easy to find . Highly recommended have already booked for next year!! We had two weeks here, it’s a lovely large open plan property with a large pool and open lake view at the back. A straight run right into Disney about 12 miles. 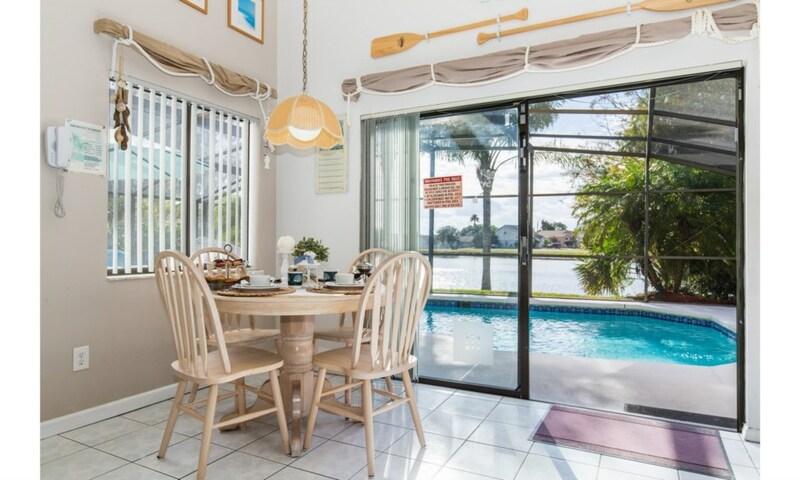 Minutes from the Florida turnpike which takes you to universal studios. Walmart, Aldi 10 mins drive. Well equipped house, nicely decorated, clean. Great for kids; come home from the parks and chill out. Bearlake villa was perfect for us. Excellent location, great view over the lake, spacious and very clean. The pool was lovely and the kids especially like the water slide....a great bonus! We particularly liked the nautical decor and the 'bean to cup' coffee machine! We look forward to staying there again! Bearlake really gave us the wow factor on arrival. Everything you could want is here, and with such a short drive to all the major attractions I cannot ever see us booking hotels again. Location was great, just 20 mins from Disney, and the extra touches like pool table and BBQ were a real positive. Excellent communication from Chris too. Would recommend, 5*, excellent! My family enjoyed a fantastic stay in this spacious 3 bedroom villa. Highlights of our stay here include the large swimming pool which our children loved, the secluded location and open aspect which provided privacy and peace and the well equipped house. The owners, were extremely helpful and provided plenty information and tips to help us make the most of our stay. I have no hesitation in recommending this great value villa! My husband,daughter and grandson (7 yrs) have recently returned from Bear lake. 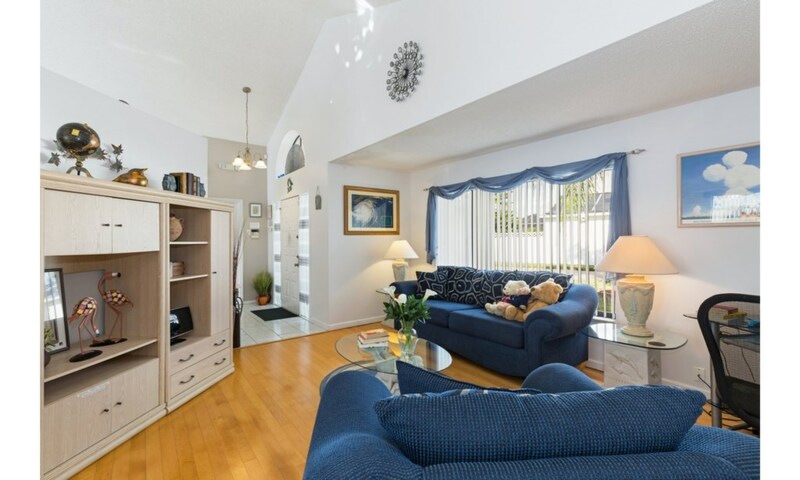 I do not hesitate to highly recommend this family home from home with all amenities. The icing on the cake for all of us was the gorgeous outdoor pool which was at a constant 75 degrees, overlooking the lake with fascinating wildlife. The villa is in a cul de sac so, very peaceful. If we return to Orlando area we would definetitely want to stay in Bear lake again. Thank you Chris for letting us enjoy your lovely spacious home. Daphne. We had so much fun staying at Bearlake villa. Our 2 young daughters especially loved the swimming pool and games room. We even cancelled our plans to attend the Disney parks on a couple of days, just so we could relax and make full use of the wonderful amenities at the villa. This was our first experience in staying in a private home and even though friends of ours had recommended it, we were still a little apprehensive. We didn't need to worry. The owners, couldn't have been more helpful. We look forward to coming again in the future. Guest name: Martyn Leigh & Family. We stayed at Bearlake in sept 2016 and I would highly recommend to anyone. The Villa itself is even better than the pictures show. We loved the pool and the main Osceola parkway takes you straight to Disney so the commute is straightforward for parks. Plenty of amenities close by for eating and shopping. A lovely relaxing villa set in a quiet neighbourhood, very comfortable and had everything you needed. Conveniently located for Walmart and lots of restaurants and only 20 minutes away from all the Disney parks. We had a very enjoyable stay especially coming home from a full day out to relax in the lovely warm pool. We had great fun staying at Bear Lake Villa. 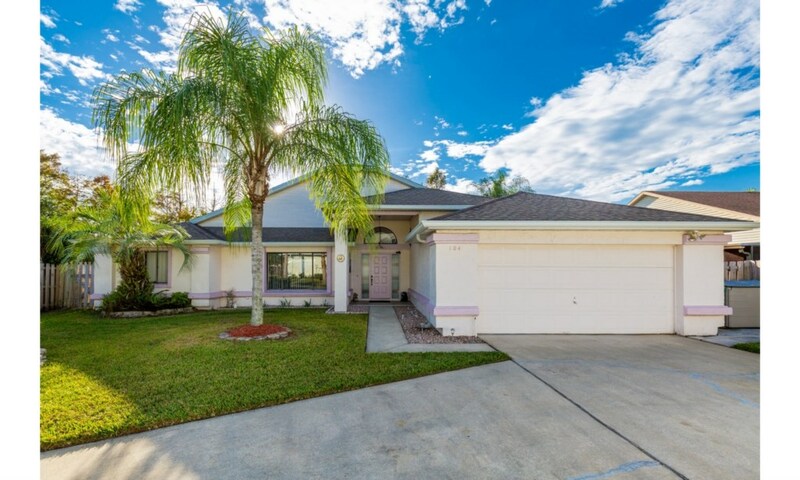 It's a lovely spacious villa and in a great location for going to Disney, only about 20 mins drive away. Very friendly neighbours. The villa is very well equipped and clean. The pool and garden are completely not overlooked in any way so you have total privacy. The kids loved hanging out in the pool and playing on the pool slide. We enjoyed the beautiful view in the evening of the sunset over the lake. It has a great games room and the kitchen has everything you need. Great communication from the owners throughout the whole booking process. We would completely recommend this villa, it was perfect. This was the third time that my wife & I have stayed at Bear Lake villa, previously two fortnight stays but had the chance to stay for a month this time, still could have stayed longer. Smashing villa, ideally located with no passing vehicular or pedestrian traffic, always feels safe. I would highly recommend this villa to all my friends & family. We've been there in Summer 2015 (July), and we've loved it from the first Minute. 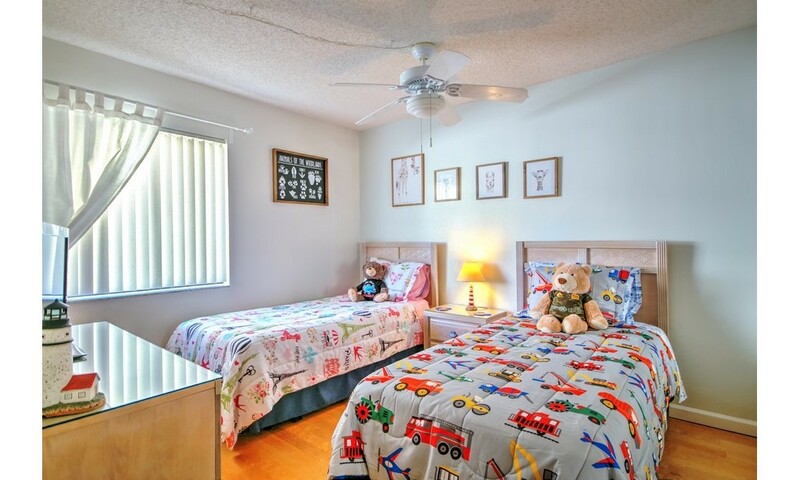 Fully equipped, lovely furnished with a beautiful pool (our Kids loved them) and well located to all well-known amusement parks of Orlando. One day, we will return and enjoy the home of Mr&Mrs Melaisi again. My family and I have had the pleasure of staying in this lovely villa on 2 occasions, it is clean comfortable with a fantastic pool area which we enjoyed having our breakfast by every morning. 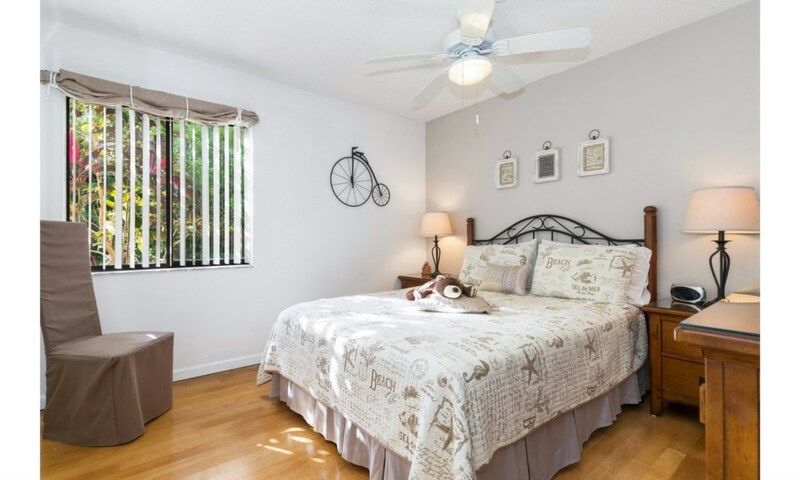 The villa is near by to all the attractions, shopping malls, and has a large Walmart & Publix supermarket nearby. There is also a large range of restaurants catering for all tastes a short drive away. 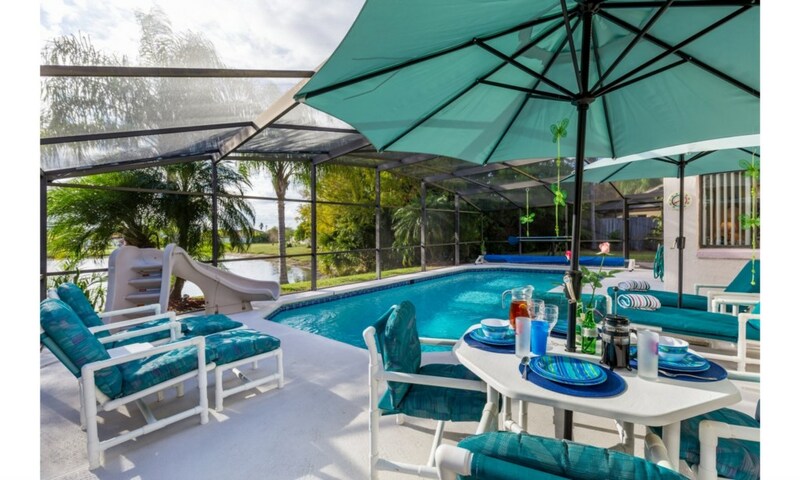 We hope to have many more holidays in Florida and would have no hesitation in rebooking this villa. We had a wonderful stay in 104 Bear Lake Villa this year and would definitely recommend this property to our friends and family. The villa is beautifully laid out with excellent facilities and a wonderful pool overlooking a small lake. The neighborhood is typically American and very relaxed and we felt very much at home. 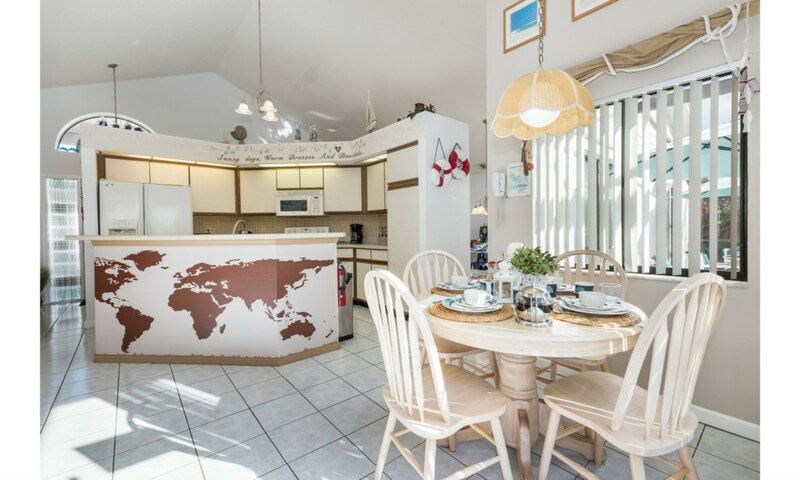 The owner, Chris, supplied a very comprehensive amount of information about Orlando with guides to all of the main attractions as well as where to eat and shop for groceries etc. We will definitely return in future years and would like to thank the owners for opening up their Florida home to us. The best Florida villa we have visited so far with plenty of parking space tucked away down a small very private road. Completely private pool area backing onto a lake. 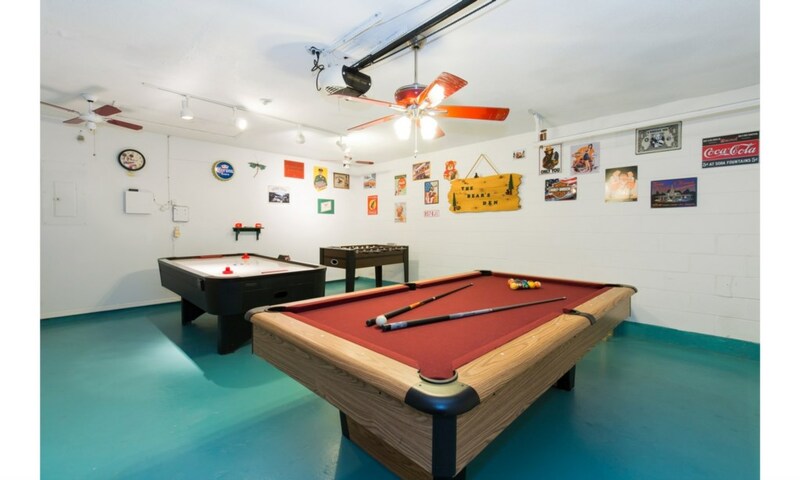 Nice size rooms, and a games area in the garage. If I ever bought a home in Florida this villa would be the target to match. We have already booked to return in 2016. This villa is just delightful. Very well placed for Disney and all the theme parks - plus there's a Walmart around the corner and lots of shops just a few minutes drive away. The villa overlooks a lake and as it's in a cul-de-sac there's no through traffic so is very peaceful. Very well equipped kitchen - plus TV (with cable) in every room - apart from the bathrooms........! 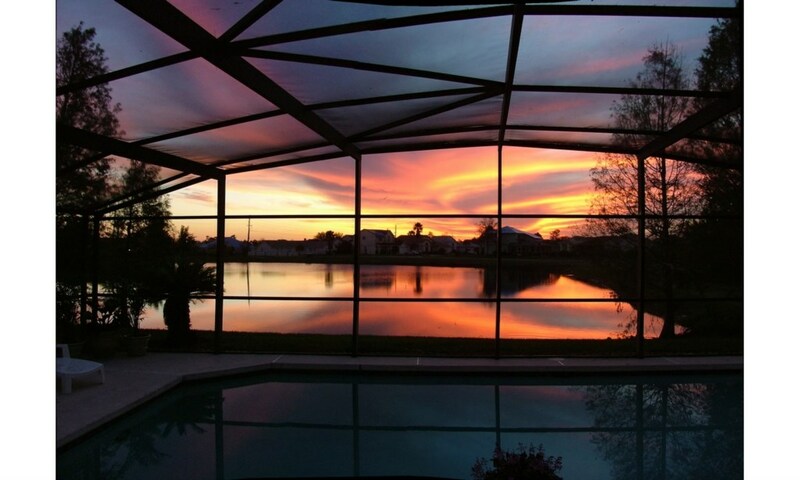 Our favourite time in Florida was when we were at the villa - sitting with a drink, our feet in the pool, and watching the sun go down over the lake. 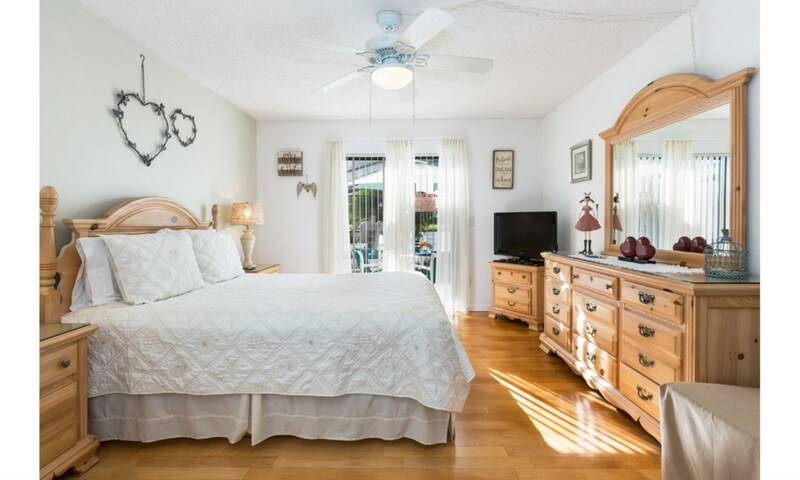 Bear lake villa is a lovely place in a relaxing and tranquil location. It was easy to get to all the major attractions from the villa. The owner was very helpful during the planning of our holiday, all of the family had a great time and we hope to return some time. Your enquiry will be sent to villa ref 796 only. This page has been viewed 379487 times since 14 Jul 2003.